A bench isn’t usually a remarkable addition to a school playground, but the new Buddy Bench at James Hillier Public School isn’t just another place to sit. 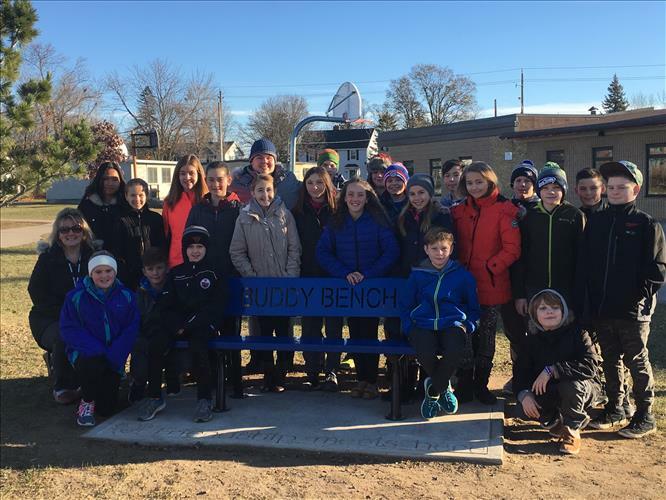 The Buddy Bench arrived this fall, and was greeted with much enthusiasm as students, parents, and staff cheered along its installation. The James Hillier School Council funded the project with the aim of fostering a friendly school community centred on compassion and empathy. To explain the bench’s purpose, students in Mrs. Clement’s Grade 6 / 7 classroom spearheaded a marketing campaign to promote the project throughout the school prior to installation. Through information posters, presentations, and skits, they informed the rest of the school of the Buddy Bench’s intent. Echoing Grand Erie’s Multi-Year Plan, the bench is promoting environments that are healthy, and that recognize the well-being of mind, body, emotion, and spirit of students and staff. Reflecting the school’s and Grand Erie’s values, the bench promotes practices that help students, families, and staff feel safe, welcomed and included, which are key indicators of the Plan in the areas of Equity, Well-being, and Community. Meanwhile, on the playground at James Hillier PS, students are actively engaged in using the Buddy Bench to sit, talk, and meet new friends at recess. In practice, the Buddy Bench is truly a place where friendship meets.